Check out The TBR Pile Review here. Read all of the Goodreads reviews here. I wish I could do like Edith Lane and just go to Paris to live my dream. But alas I can read about it only. This was a fun book. I enjoyed it very much. 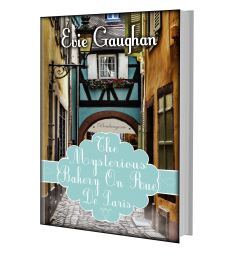 A sweet little book that cozy mystery fans might like. I liked that it was light on the romance and heavy on the baked goods. Read The Bearded Bookworm’s Four Star Review here. After having no contact with her biological family following her parents deaths at a young age Amanda out of the blue receives contact from a law firm informing her that her aunt has died and left her a medal in her will. After experiencing flashbacks during a hypnotherapy session it becomes clear that this medal may be even more important than simply being the only remaining connection to her biological family. Why does she keep having dreams of drowning? What exactly is the medal and how did her aunt come to have it in her possession? Are her visions representative of her inner emotions or are they memories of a previous life? And more importantly, what does the mysterious Spaniard Xavier have to do with it all? 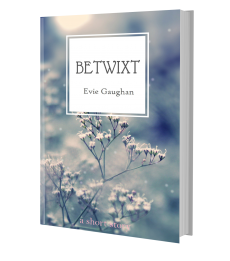 Four star review from Trish at Between My Lines here. “The Cross of Santiago” is an intelligent and well written historical romance book. I love historical fiction with a bit of romantic story-line thrown in and this book sure fits the bill. The beginning looked promising and what followed didn’t disappoint. Check out the reviews on Barnes & Noble here. “The Cross of Santiago is a heart-warming, astonishing novel of love and destiny. Mira’s enchanting review on Forever Book Lover here. Amazon reviews for The Heirloom can be found here. Read Goodreads reviews for The Heirloom here. Greetings, Ms. Gaughan!, The link for adding The Heirloom to one’s Goodreads book shelf, goes to the Goodreads Page for The Cross of Santiago, which I think is a previous title/edition for The Heirloom. I recommend updating that link to the Goodreads page for The Heirloom. 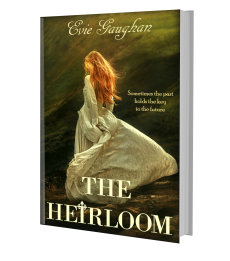 The Heirloom is currently on my Goodreads Bookshelf, but I am waiting until I finish the book before posting any reviews.